If you enter a Password incorrectly into your Ryver Account login more than 5 times in a row, you will receive an”Account Locked” message for your User Account. 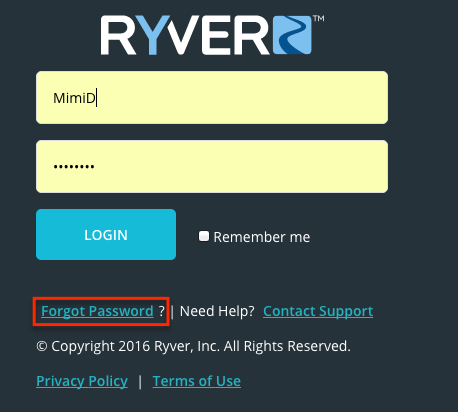 To reset, simply move to the Ryver login page on any Ryver App or browser and click the “Forgot Password” link on the login screen. Once you click the “Forgot Password” link, enter your email address and then click “Reset”. If you enter a valid Ryver email address or Username, you should see a message that tells you to check your email as Ryver will send you a “Reset Password” link via email. If you do not enter a valid email address/Username, the “Reset” button will remain on the screen. You may want to try another email address that you may have used. Upon resetting your password, your User Account will be unlocked.